Chelsea are reportedly eyeing a £36m bid for PSV forward Hirving Lozano as they continue to struggle for goals this season. The Blues have scored 38 goals in 21 Premier League games so far this season, giving them the lowest tally of the top six sides in the standings. To put that into further context, league leaders Liverpool have scored 10 more than them, while even Man Utd through their struggles under Jose Mourinho have managed 43 goals. 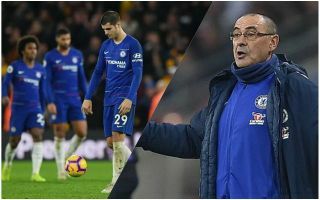 In turn, it’s an area in which Maurizio Sarri needs a long-term solution as Chelsea need a consistent source of goals to fire them to success both domestically and in Europe. With that in mind, The Sun report that they could launch a £36m bid to sign Lozano, with the Mexican international continuing to impress in Holland as he seemingly has a bright future ahead of him. Still only 23 years of age, he has bagged 34 goals in 61 appearances for PSV over the last two seasons, while he’s scored eight goals in 34 caps for Mexico. Coupled with the signing of Christian Pulisic which was confirmed on Wednesday by Chelsea, it appears as though the Premier League giants could be adopting a new transfer strategy of building for the long-term future by adding key individuals of a younger age. Should a move be made for Lozano though, it remains to be seen if PSV are willing to sell and if the player himself is ready for the next chapter in his career. Nevertheless, from a Chelsea perspective, with Alvaro Morata and Olivier Giroud failing to offer goals consistently, they will need to address that problem area sooner rather than later, albeit perhaps a prolific main striker with a proven track record should be prioritised.